Smartsheet is a project management tool which essentially relies on a spreadsheet format for managing projects and tasks. Introduced in 2006, with a major redesign in 2010, the platform serves as a single systematic and flexible solution for all the task management needs of a team. Being a spreadsheet program at its core, Smartsheet already calls for multiple alternatives. Although it has extensive features that cater to the project management needs, let’s be realistic! There’s not a single tool that can be the gold standard for fulfilling all the project management needs of an organization. Same goes for Smartsheet, because of a few reasons. Being able to track the time associated with each and every project is one of the most critical aspects of a project management software. Smartsheet doesn’t come with extensive time tracking features. You cannot track the time you’ve spent on a particular task, and that tends to be one of the biggest drawbacks of the tool. For timely collaboration among team members, real-time chat feature or comments within tasks should be a core element. Smartsheet doesn’t come with real-time chat options for team members to collaborate on the project progress. Although Smartsheet does have a reporting feature, it’s too complicated to use. For a fully functional project report, users have to go through multiple steps and personally create a report. This is time-consuming, as well as frustrating. In contrast with the majority project management tools available freely in the market, Smartsheet can come off as quite expensive. With only a 30 days free trial period and upgrades starting from $14, Smartsheet calls for other cheaper alternatives to consider. The top spot on this list of free Smartsheet alternatives goes to nTask. A versatile project management software equipped with an intelligent toolset that caters perfectly to all individual as well as team task management needs. With a simple user interface and smartly developed features, nTask facilitates seamless storing, processing, and monitoring of project performance – all under one roof. Simpler project management with nTask, absolutely free! 5 workspaces, task management, project Gantt charts, bug and issue tracking and a lot more. Next up on our list of free Smartsheet alternatives is Basecamp. It’s an online project management tool providing collaboration solutions to small and medium sized organizations. Coming with a diverse toolset, Basecamp tries to provide a single platform to users for effectively managing their projects. Basecamp comes with a free trial of 30 days. Third on our list of free Smartsheet alternatives is Jira. Considered a #1 software chosen by agile teams for software development, Jira makes a pretty strong contender for Smartsheet. The tool allows teams to use workflow mapping and agile reporting techniques to make sure projects are executed efficiently. Jira offers a free trial of 7 days. Airtable is a cloud-based project management software which combines the functionality of a task management tool and a spreadsheet to provide the most user-friendly experience while managing projects. A free Smartsheet alternative, Airtable comes with a pleasing design and easy interface to help users have fun while getting things done. The 5th tool in our collection of best free Smartsheet alternatives is Clarizen. It’s a collaborative work management solution designed and developed for enterprises. Providing an option to configure workflows according to the team needs, Clarizen facilitates a highly customizable and advanced platform for project management. One of the top Smartsheet alternatives that project managers love is Asana. 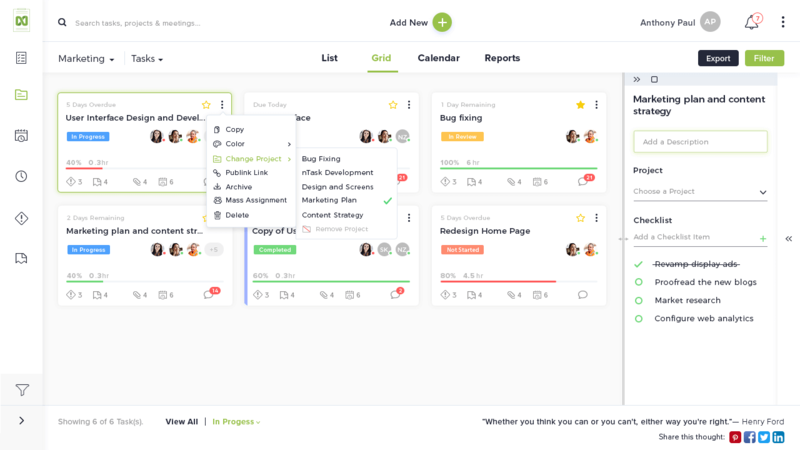 Regarded as one of the most popular tools when it comes to project management, Asana allows you to smartly organize and tackle your project details with maximum efficiency. The tool comes with multiple project templates, designed to serve diverse team types and their project needs. With multiple third-party application integrations, Asana makes sure you get everything done without switching applications. Redbooth is a project management software that comes with a dynamic feature set, enabling teams to manage their projects successfully from initiation till project closure. This Smartsheet alternative comes with a beautiful and intuitive user-interface. Through dashboard, you can quickly view your urgent tasks and take a quick glance over your project performance. Furthermore, remote teams can take advantage of HD video conferencing mode to hold virtual team meetings whenever required. If you’re looking for more than just basic project management, Mavenlink is the right Smartsheet alternative for you. Coming with a solid feature set of project management, resource management, business intelligence, and team collaboration, Mavenlink seems to cater it all. Through Gantt charts, you can plan and monitor your project performance effectively and streamline operations along the way. Additionally, your project portfolio facilitates in evaluating your overall project health in a better way. An enterprise level project management software, Celoxis is a powerful Smartsheet alternative you can get your hands on. Perfect for medium to large sized organizations, Celoxis helps manage complex projects through native solutions. These solutions range from easy project planning to more advanced resource management. Through the customizable project portfolio dashboards, you can easily monitor your project KPIs and make informed decisions faster. Freedcamp is a free Smartsheet alternative which makes managing of multiple tasks quick and easy. The tool comes with an internal wiki to keep all the organization’s data in one place to be accessed at any time you want. Through milestones, you can create significant project events and give your team something to look forward to over the course of project lifecycle. Moreover, with the issue tracker, your project issues can be easily tracked and resolved within due time. What are your favorite free Smartsheet alternatives? Share your recommendations in the comments below.